One of the more appealing aspects of holistic medicine is that it affords many choices for health care consumers. For example, if you’re consistently stressed out, you can opt for natural treatments ranging from aromatherapy to visualization. If chronic pain is your issue, acupuncture or nutritional supplements may alleviate some or all of your discomfort. This is reassuring to know because it allows you to apply your own personal preferences when deciding upon a therapeutic protocol. That alone tips the balance of healing in your favor because it empowers you. Reflexology is one of my favorite healing modalities. It’s essentially a variety of acupressure that is applied to the soles and toes. Proponents of reflexology claim that specific points and regions of the feet correspond with glands, organs and systems throughout the body. However, this theory is not universally accepted. In fact, even some advocates aren’t convinced of the whole body reflexive effect espoused by reflexologists. Rather, they believe that the anecdotal and clinical benefits noted are more likely due to chemical and psychological shifts that are similar to what one could expect from other forms of bodywork or massage. Earlier I mentioned conflicting views about how and why reflexology achieves therapeutic outcomes. I’m not convinced that the reflex theory holds water. I’m certainly open to the idea, but I don’t think it’s been scientifically validated as of yet. What I can tell you is that I find individual, though sporadic, reflexology sessions profoundly enjoyable and relaxing. I feel great afterwards. But, I can’t draw any firm conclusions because I simply haven’t received a consistent course of treatment. This is why I’m hoping to see more solid research in the coming years that will provide a stronger foundation for this form of bodywork. In the meantime, I may just invest some time in learning more about “self reflexology”. The price is right and the benefits may be many. Almost 2 years ago my wife had lingered unconscious for weeks, dying with cancer in Hospice. Then one night I massaged her feet for 20 or 30 minutes until I got tired. When I stopped to rest, she breathed her final breath. Tomorrow is our 50th anniversary. I’m not sure how to respond except to say that I suspect the last thing your wife felt was the love that you expressed by way of the massage. When my wife is having a hard time or is in pain, I often try to ease it by massaging her feet or neck. Unfortunately, it doesn’t cure all of life’s insults. But, I think it somehow bridges the gap between the body and mind. Touch is powerful. A loving touch is even more powerful. Thank you for sharing that intimate moment with us. It meant a lot to me. I really love foot reflex, me and my hubby take turns on massaging each others feet.. so relaxing and soothes all the tensions and stress. Yes, I agree a loving touch is very powerful. Thank you, Jenny. We enjoy it too. A great way to end the day. Many pregnant women with LBPP use pain medications to manage this pain, much of which is self-prescribed and potentially harmful. Therefore, there is a need to find effective nonpharmacological treatments for the condition. Reflexology has previously been shown to help nonspecific low back pain. Therefore; a pilot RCT was conducted investigating reflexology in the management of pregnancy-LBPP. 90 primiparous women were randomised to either usual care, a reflexology or footbath intervention. Primary outcome measures were; the Pain Visual Analogue Scale (VAS). 64 women completed the RCT; retention rates for the reflexology group were 80%, usual care group 83.33% and footbath group 50%. The reflexology group demonstrated a Clinically Important Change (CIC) in pain frequency (1.64cm). Results indicate it is feasible to conduct an RCT in this area, although a footbath is an unsuitable sham treatment. Reflexology may help manage pregnancy-LBPP; however a fully powered trial is needed to confirm this. The Effect of Foot Reflexology on Acute Pain in Infants: A Randomized Controlled Trial. AIM: This study was a randomized controlled trial designed to evaluate the effect of foot reflexology applied on infants on acute pain that may arise after vaccine injection. METHODS: The sample consisted of 1- to 12-month-old infants registered in a family health center in Istanbul, Turkey, for healthcare follow-up. A total of 60 infants who met the criteria of the sample group were included in the study; 30 infants constituted the reflexology group and the other 30 constituted the control group. Although questionnaire forms were used to determine the descriptive characteristics of infant-mother pairs, the Face, Legs, Activity, Cry, Consolability (FLACC) Pain Assessment Scale was used to evaluate pain level. Infants in the reflexology group received reflexology treatment for an average of 20-30 minutes before vaccination, depending on the physical size of the infant’s foot. Pain, heart rate, oxygen saturation levels, and crying periods of infants in the reflexology and control groups were evaluated before and after vaccination. RESULTS: The FLACC pain score was observed to be statistically similar between groups. After reflexology was applied to infants in the reflexology group before vaccination, it was determined that the pain score was reduced to .50 ± 1.14. In the examination performed after vaccination, FLACC pain score was found to be 5.47 ± 2.11 in the reflexology group and 9.63 ± .85 in the control group. A statistically significant difference was observed between the mean FLACC pain scores of infants in the reflexology and control groups (p = .000). The infants in the reflexology group also had lower heart rates, higher oxygen saturation, and shorter crying periods than the infants in the control group (p <.001). LINKING EVIDENCE TO ACTIONS: Reflexology before vaccine reduced the pain level experienced after vaccination. Future research needs to explore different interventional practices. Int J Nurs Stud. 2015 Jul 26. The impact of hand reflexology on pain, anxiety and satisfaction during minimally invasive surgery under local anaesthetic: A randomised controlled trial. BACKGROUND: Elevated patient anxiety during surgery is linked to a range of suboptimal treatment outcomes. Reflexology has been reported to be effective in reducing pre and post-operative anxiety and post-operative pain. OBJECTIVES: To explore whether the addition of hand reflexology to treatment as usual during minimally invasive varicose vein surgery under local anaesthetic impacted upon patient reported anxiety and pain during surgery, and patient satisfaction with treatment. SETTING: Private outpatient clinic specialising in venous conditions. PARTICIPANTS: 137 participants were assessed for eligibility. One hundred patients were recruited (mean age 47.8 years, 83% female). Participants received endovenous thermal ablation and/or phlebectomy for the treatment of varicose veins. Inclusion criteria included age (between 18 and 80) and receiving endovenous thermal ablation and/or phlebectomy for the treatment of varicose veins under local anaesthetic. Exclusion criteria included the presence of leg ulcers and receiving microsclerotherapy or foam sclerotherapy treatments, being unwilling to enter into the randomisation process and arriving late at the clinic. METHODS: Participants were randomly allocated to either treatment as usual (control group) or intra-operative hand reflexology during minimally invasive varicose vein surgery under local anaesthetic. Participants in the reflexology group received a session of intra-operative hand reflexology which began in the operating theatre, prior to analgesic injections and continued until surgery was complete. It was not possible to blind the participants, researchers or theatre staff to group allocation due to the modifications required to the operating theatre for participants in the reflexology group. The researcher could not be blinded due to the role they played in the trial organisation. RESULTS: Of the 137 participants screened for eligibility, 7 participants declined to participate and a further 30 did not meet the inclusion criteria, giving a recruitment rate of 93%. Fifty participants were randomised to the reflexology group and fifty participants were randomised to the control group. Intra-operative anxiety was significantly lower in the reflexology group (mean score of 3.24 on an 11-point rating scale) than the control group (mean score of 5.0, p<.001). CONCLUSIONS: Intra-operative hand reflexology is a useful adjunct to local anaesthetic varicose vein surgery, with participants in the reflexology group reporting significantly lower intra-operative anxiety and shorter pain duration than participants receiving treatment as usual. J Korean Acad Nurs. 2015 Aug;45(4):587-94. [Effects of Foot-Reflexology Massage on Fatigue, Stress and Postpartum Depression in Postpartum Women]. PURPOSE: To identify the effects of foot reflexology massage on fatigue, stress and depression of postpartum women. METHODS: A nonequivalent control group pre-post design was used. A total of 70 women in a postpartum care center were recruited and were assigned to the experimental group (35) or control group (35). Foot reflexology massage was provided to the experimental group once a day for three days. Data were collected before and after the intervention program which was carried out from December, 2013 to February, 2014. Data were analyzed using Chi-square test, Fisher’s exact test, and t-test. RESULTS: The level of fatigue in the experimental group was significantly lower than the control group (t=-2.74, p=.008). The level of cortisol in the urine of women in the experimental group was significantly lower than the control group (t=-2.19, p=.032). The level of depression in the experimental group was significantly lower than the control group (t=-3.00, p=.004). CONCLUSION: The results show that the foot reflexology massage is an effective nursing intervention to relieve fatigue, stress, and depression for postpartum women. J Complement Integr Med. 2015 Nov 18. A comparison of the effects of reflexology and relaxation on pain in women with multiple sclerosis. BACKGROUND: Pain is a common and significant symptom in many individuals with multiple sclerosis (MS). The presence and severity of pain in individuals with MS has also been shown to be associated with higher levels of depression, functional impairment, and fatigue. It is common for MS patients and their caregivers to worry about narcotic addiction in the management of chronic pain. Therefore, this study aimed to determine and compare the effects of reflexology and relaxation on pain in women suffering from MS.
METHODS: This study was a single-blind randomized clinical trial performed on 75 patients with MS referred to the MS Clinic of Ayatollah Kashani Hospital (Isfahan, Iran). After simple non-random sampling, using the minimization method, participants were randomly assigned to the three groups of reflexology, relaxation, and control. In the experimental groups, foot reflexology and relaxation interventions (Jacobson and Benson) were performed within 4 weeks, twice a week for 40 min. The control group received routine care and medical treatment as directed by a doctor. Data were collected using the Numerical Rating Scale before, immediately after, and 2 months after interventions in all three groups. Data analysis was performed using SPSS version 18 and descriptive and inferential statistical tests. RESULTS: Findings obtained from analysis of variance (ANOVA) showed no significant differences between mean pain intensity scores in the three groups preintervention and 2 months after interventions (p > 0.05). However, this difference was statistically significant immediately after the study (p < 0.05). Findings obtained from repeated measures ANOVA showed that the severity of pain significantly differed during different times in reflexology and relaxation (p 0.05). Furthermore, Fisher’s least significant difference (LSD) revealed a significantly higher reduction in pain intensity scores in the reflexology group after the intervention, compared with the two other groups, but showed no significant differences between relaxation and control groups. There were no significant differences between the three groups 2 months after the interventions (p > 0.05). CONCLUSIONS: The results showed that both interventions are effective on relieving pain in women with MS; however, it appears that the effect of reflexology on pain reduction is greater than that of relaxation. Hence, these two methods can be recommended as effective techniques. Iran Red Crescent Med J. 2015 Nov 1;17(11):e20111. Comparing the Effects of Reflexology and Footbath on Sleep Quality in the Elderly: A Controlled Clinical Trial. BACKGROUND: Sleep disorders are common mental disorders reported among the elderly in all countries, and with nonpharmacological interventions, they could be helped to improve their sleep quality. OBJECTIVES: The aim of this study was to compare the effects of two interventions, foot reflexology and foot bath, on sleep quality in elderly people. PATIENTS AND METHODS: This three-group randomized clinical trial (two experimental groups and a control group) was conducted on 69 elderly men. The two experimental groups had reflexology (n = 23) and foot bath (n = 23) interventions for 6 weeks. The reflexology intervention was done in the mornings, once a week for ten minutes on each foot. The participants in the foot bath group were asked to soak their feet in 41°C to 42°C water one hour before sleeping. The pittsburgh sleep quality index (PSQI) was completed before and after the intervention through an interview process. RESULTS: The results showed that the PSQI scores after intervention compared to before it in the reflexology and foot bath groups were statistically significant (P = 0.01 , P = 0.001); however, in the control group did not show a statistically significant difference (P = 0.14). In addition, the total score changes among the three groups were statistically significant (P = 0.01). Comparing the score changes of quality of sleep between the reflexology and foot bath groups showed that there was no significant difference in none of the components and the total score (P = 0.09). The two interventions had the same impact on the quality of sleep. CONCLUSIONS: It is suggested that the training of nonpharmacological methods to improve sleep quality such as reflexology and foot bath be included in the elderly health programs. In addition, it is recommended that the impact of these interventions on subjective sleep quality using polysomnographic recordings be explored in future research. Rehabil Nurs. 2016 Mar 9. The Effect of Reflexology Applied to Patients with Chronic Obstructive Pulmonary Disease on Dyspnea and Fatigue. PURPOSE: The purpose of this study was to determine the effect of reflexology on reducing dyspnea and fatigue in patients with chronic obstructive pulmonary disease (COPD). DESIGN/METHODS: The study was conducted as a pretest-posttest experimental design. The population of the study consisted of 60 patients (30 in experimental group and 30 in control group). Patient Description Form, Baseline Dyspnea Index (BDI) and Visual Analogue Scale-Fatigue (VAS-F) were used to collect the data. RESULTS: The difference between pretest-posttest dyspnea and fatigue mean scores of patients in the experimental group was statistically significant (p < .01). The difference between pretest-posttest dyspnea and fatigue mean scores of patients in the control group was statistically insignificant (p > .05). CONCLUSION: It was determined that the reflexology reduced dyspnea and fatigue in patients with COPD. CLINICAL RELEVANCE: Complementary methods such as reflexology should be used with pharmacological methods to reduce dyspnea and fatigue of COPD patients. PLoS One. 2016 Mar 24;11(3):e0151712. The Effects of Aroma Foot Massage on Blood Pressure and Anxiety in Japanese Community-Dwelling Men and Women: A Crossover Randomized Controlled Trial. OBJECTIVES: The aim of this study was to investigate the effects of aroma foot massage on blood pressure, anxiety, and health-related quality of life (QOL) in Japanese community-dwelling men and women using a crossover randomized controlled trial. METHODS: Fifty-seven eligible participants (5 men and 52 women) aged 27 to 72 were randomly divided into 2 intervention groups (group A: n = 29; group B: n = 28) to participate in aroma foot massages 12 times during the 4-week intervention period. Systolic and diastolic blood pressure (SBP and DBP, respectively), heart rate, state anxiety, and health-related QOL were measured at the baseline, 4-week follow-up, and 8-week follow-up. The effects of the aroma foot massage intervention on these factors and the proportion of participants with anxiety were analyzed using a linear mixed-effect model for a crossover design adjusted for participant and period effects. Furthermore, the relationship between the changes in SBP and state anxiety among participants with relieved anxiety was assessed using a linear regression model. RESULTS: Aroma foot massage significantly decreased the mean SBP (p = 0.02), DBP (p = 0.006), and state anxiety (p = 0.003) as well as the proportion of participants with anxiety (p = 0.003). Although it was not statistically significant (p = 0.088), aroma foot massage also increased the score of mental health-related QOL. The change in SBP had a significant and positive correlation with the change in state anxiety (p = 0.01) among participants with relieved anxiety. CONCLUSION: The self-administered aroma foot massage intervention significantly decreased the mean SBP and DBP as well as the state anxiety score, and tended to increase the mental health-related QOL scores. The results suggest that aroma foot massage may be an easy and effective way to improve mental health and blood pressure. Arch Psychiatr Nurs. 2016 Jun;30(3):375-81. Research on the Effect of the Foot Bath and Foot Massage on Residual Schizophrenia Patients. Researchers performed foot baths and massages for residual schizophrenia patients to gauge the effects on psychiatric symptoms. Subjects were six residual schizophrenia patients hospitalized in a psychiatric hospital. Three times a week for 4weeks, they received an 8-minute effleurage massage to their legs after a 10-minute foot bath. The effect of physiological relaxation was identified by a significant decline in heart rate in all cases. The results of the Positive and Negative Symptom Scale are as follows: a mean score of 29.0 was measured before treatment, which lowered to 21.5 after treatment, indicating that foot care improved their negative symptoms (p<0.05).The results of the Quality of Life Scale before the foot care intervention, were 10.5 and increased to 34.0 after the intervention, indicating improvement in their quality of life (p<0.05). The results of the two measurements indicate that foot baths and massages were effective in improving psychiatric symptoms. Holist Nurs Pract. 2016 Sep-Oct;30(5):294-300. Effect of Reflexology to Depressive Symptoms in Women With Overactive Bladder. This study is to determine the effect of foot reflexology on the level of depression in women with OAB. Study findings included in the study showed foot reflexology as a part of OAB treatment relieved urinary and depressive symptoms and had a positive effect on quality of life. Complement Ther Clin Pract. 2016 Aug;24:78-85. The effect of foot reflexology applied to women aged between 40 and 60 on vasomotor complaints and quality of life. PURPOSE: This study aims to identify the effects of foot reflexology applied to women on their vasomotor complaints and quality of life. METHODS: A randomised controlled study was conducted with 120 women. The experimental group received foot reflexology treatment, while the control group received nonspecific foot massage. RESULTS: The mean scores for hot flashes, sweats, and night sweats, were lower in the reflexology group than the control group after the practice; and the difference between the groups was statistically significant (p < 0.001). The mean scores for the sub-groups of the MENQOL demonstrated improvements in both groups after the application (p < 0.001). As for the sexual domain, there was a significant improvement in the reflexology group (p < 0.05), but no improvements were found in the control group (p > 0.05). CONCLUSION: Results showed that reflexology might be effective in decreasing vasomotor problems and increasing quality of life in women in the menopausal period. Holist Nurs Pract. 2016 Nov/Dec;30(6):351-359. Effects of Reflexology on Pain in Patients With Fibromyalgia. The aim of this study was to investigate the effect of reflexology on pain intensity in patients with fibromyalgia, using an experimental repeated-measures design, and a convenience sample of 30 fibromyalgia inpatients. Thirty patients aged 18 to 70 years with fibromyalgia and hospitalized in the algology clinic were taken as a convenience sample. Patients received a total of 12 60-minute sessions of reflexology over a period of 6 consecutive weeks. Reflexology was carried out bilaterally on the hands and feet of patients at the reflex points relating to their pain at a suitable intensity and angle. Subjects had pain scores taken immediately before the intervention (0 minute), and at the 60th minute of the intervention. Data were collected over a 10-month period in 2012. The patients’ mean pain intensity scores were reduced by reflexology, and this decrease improved progressively in the first and sixth weeks of the intervention, indicating a cumulative dose effect. The results of this study implied that the inclusion of reflexology in the routine care of patients with fibromyalgia could provide nurses with an effective practice for reducing pain intensity in these patients. Iran J Nurs Midwifery Res. 2016 Sep-Oct;21(5):487-492. The effect of reflexology on pain perception aspects in nurses with chronic low back pain in Isfahan. BACKGROUND: The most important part in experiencing and recognizing the threshold of pain is the perception of pain. Reflexology is a kind of complementary therapy which is rooted in the beliefs of the community. This study was aimed to determine the effect of reflexology on pain perception aspects in patients with chronic low back pain. MATERIALS AND METHODS: This single-blind clinical trial study was performed on 50 nurses with chronic low back pain, who were selected by convenient sampling and then randomly divided into the case and the control groups. Reflexology was conducted for 2 weeks in both groups as three 40-min sessions per week. Perception aspects of pain were measured using the McGill pain perceptual dimension scale score. Data analysis was performed using SPSS. RESULTS: The overall mean scores of perceptual aspects of pain after the intervention in the case and the control groups were 20 ± 5.97 and 29.60 ± 7.38, respectively, and independent t-test showed a statistically significant difference between the two groups (P < 0.001). Comparing the results in the cognitive aspects of pain separately showed a significant difference between the two groups in the aspects of sensory, pain assessment, and diversity before and after the intervention (P < 0.001), but the difference in the emotional aspect was not significant. CONCLUSIONS: Reflexology, which can be done by nurses, has the ability to reduce the intensity score and cognitive aspects of pain. Therefore, it is proposed to be included in patients’ surveillance. Int J Nurs Pract. 2017 Feb 7. Effects of foot massage applied 2 different methods on symptom control in colorectal cancer patients: Randomized control trial. This randomized controlled clinical study aimed to determine the effect of 2 foot massage methods on symptom control in people with colorectal cancer who received chemoradiotherapy. Data were collected between June 16, 2015, and February 10, 2016, in the Department of Radiation Oncology of an oncology training and research hospital. The sample comprised 60 participants. Data were collected using an introductory information form, common terminology criteria for adverse events and European Organization for Research and Treatment of Cancer Quality of Life Questionnaires C30 and CR29. Participants were randomly allocated to 3 groups: classical foot massage, reflexology, and standard care control. The classical massage group received foot massage using classical massage techniques, and the reflexology group received foot reflexology focusing on symptom-oriented reflexes twice a week during a 5-week chemoradiotherapy treatment schedule. The control group received neither classical massage nor reflexology. All patients were provided with the same clinic routine care. The classical massage was effective in reducing pain level and distension incidence while foot reflexology was effective in reducing pain and fatigue level, lowering incidence of distension and urinary frequency and improving life quality. J Altern Complement Med. 2017 May 3. Effects of Combined Foot Massage and Cognitive Behavioral Therapy on the Stress Response in Middle-Aged Women. OBJECTIVE: Several intervention studies have suggested that foot massage and cognitive behavioral therapy (CBT) are beneficial for reducing the stress response. However, no randomized control trials have been conducted to examine these effects in middle-aged women, who are more commonly exposed to stress relative to others. This study aimed to examine the effects of combined self-administered foot massage and CBT on the psychophysiological stress response in Korean middle-aged women. SETTING: Subjects were recruited from the social welfare center in Sahmcheok, Kangwondo, Korea. The subjects performed some of the massage at the center and some at home, and CBT was performed at the center. SUBJECTS: Fifty-three women aged 45-64 years were randomly assigned to Group A (intervention, n = 31) or B (usual care, n = 30). INTERVENTION: Combined self-administered foot massage and CBT. OUTCOME MEASURES: Depression, anxiety, stress, blood pressure, heart rate, blood glucose (BG), and oxygen saturation were measured at baseline and 3-week follow-up. RESULTS: Mean depression scores (p = 0.021), stress scores (p = 0.009), systolic blood pressure (SBP) (p = 0.035), and BG levels (p = 0.007) had decreased significantly subsequent to the intervention. CONCLUSION: Combined self-administered foot massage and CBT led to reductions in depression, stress, SBP, and BG levels. Therefore, the intervention could be an effective means of reducing the stress response in middle-aged women. J Educ Health Promot. 2017 Apr 19;6:11. A comparison the effects of reflexology and relaxation on the psychological symptoms in women with multiple sclerosis. BACKGROUND:Multiple sclerosis (MS) occurs with a variety of physical and psychological symptoms, yet there is not a conclusive cure for this disease. Complementary medicine is a current treatment which seems is effective in relieving symptoms of patients with MS. Therefore, this study is aimed to determine and compare the effects of reflexology and relaxation on anxiety, stress, and depression in women with MS. SUBJECTS AND METHODS: This study is a randomized clinical trial that is done on 75 women with MS referred to MS Clinic of Kashani Hospital. After simple non random sampling, participants were randomly assigned by minimization method to three groups: reflexology, relaxation and control (25 patients in each group). In the experimental groups were performed reflexology and relaxation interventions within 4 weeks, twice a week for 40 min and the control group were received only routine treatment as directed by a doctor. Data were collected through depression anxiety and stress scale questionnaire, before, immediately after and 2 months after interventions in all three groups. Chi-square, Kruskal-Wallis, repeated measures analysis of variance and one-way analysis of variance and least significant difference post hoc test via SPSS version 18 were used to analyze the data (P < 0.05) was considered as significant level. RESULTS: The results showed a significant reduction in the severity of anxiety, stress and depression during the different times in the reflexology and relaxation groups as compared with the control group (P < 0.05). CONCLUSION: The results showed that reflexology and relaxation in relieving anxiety, stress and depression are effective in women with MS. Hence, these two methods, as effective techniques, can be recommended. Asia Pac J Oncol Nurs. 2017 Jul-Sep;4(3):241-249. The Effect of Reflexology on Chemotherapy-induced Nausea, Vomiting, and Fatigue in Breast Cancer Patients. OBJECTIVE: Patients receiving chemotherapy struggle with the side effects of this treatment. These side effects obligate the patients to use not only the pharmacological methods but also non-pharmacological relaxing methods. This study was conducted to determine the effect of reflexology on chemotherapy-induced nausea, vomiting, and fatigue in breast cancer patients. METHODS: The study was conducted as a pretest-posttest experimental design. The study was conducted with sixty patients, thirty as the control and thirty as the experimental groups. A sociodemographic form, Rhodes index of nausea, vomiting, and retching (INVR), and Brief Fatigue Inventory (BFI) were used to collect the data. Analysis of variance, t-test, percentage calculations, and Chi-square methods were used to evaluate the data. The data obtained were assessed using the “Statistical Package for Social Science 21.0″ software. RESULTS: It was determined that the difference between the total mean scores of INVR in the experimental and control groups was significant on the onset and first and second measurements, and the difference between total mean scores of development and distress between the groups was statistically significant in the third measurement (P < 0.05). The results of the study showed that the BFI mean scores of patients in the experimental group gradually decreased in the first, second, and third measurements (P < 0.05). CONCLUSIONS: The present study proved that reflexology decreased the experience, development, distress of nausea, vomiting, and retching as well as fatigue in the experimental group. Hence, the use of reflexology is recommended for chemotherapy-induced nausea, vomiting, and fatigue. J Clin Diagn Res. 2017 Jun;11(6):QC01-QC04. Effects of Counselling and Sole Reflexology on Fatigue in Pregnant Women: A Randomized Clinical Trial. INTRODUCTION: Increase of fatigue may lead to problems during pregnancy, delivery and post delivery. 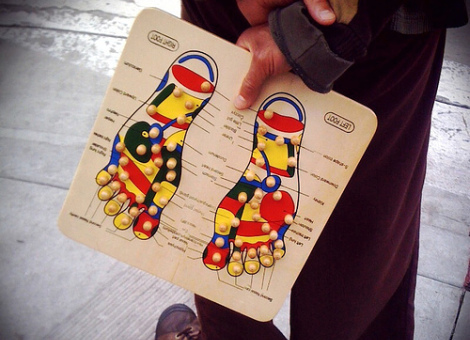 Sole reflexology is the application of pressure to areas on the feet. Reflexology is generally relaxing and may be an effective way to alleviate fatigue and stress. AIM: To investigate the effect of counselling and sole reflexology on fatigue in pregnant women, referred to the medical centers of Hamadan city, Iran. MATERIALS AND METHODS: This study was a randomized clinical trial with three groups – Group A (counselling and reflexology), Group B (reflexology) and Group C (control) with pre and post intervention. A total of forty two pregnant women were selected for each group. Measurement tool was a 30 question standard checklist for fatigue assessment. For all three groups, an explanatory session was held to get their written consents and conduct a pretest. The intervention included five education sessions, twice a week about reflexology in the form of counselling and sole reflexology. The groups were assessed immediately after intervention. Data were analysed using IBM SPSS Statistics 20.0. To analyse the data, descriptive statistics, t test and ANOVA with repeated measures were used. RESULTS: In group A and group B, the mean score of fatigue severity after the intervention demonstrated a significant decrease (p<0.05); furthermore, after intervention, a significant difference was observed between the control and experimental groups in terms of fatigue severity (p<0.01). CONCLUSION: Based on the results of this study, counseling and sole reflexology significantly decreased fatigue in pregnant women. It is hoped that the results of this study can be used by all treatment groups and midwives for controlling and providing midwifery cares for pregnant women. A pilot randomised controlled trial exploring the effects of antenatal reflexology on labour outcomes. OBJECTIVE: To investigate the effects of antenatal reflexology on labour outcomes. DESIGN: Secondary analysis of a pilot three-armed randomised controlled trial conducted between July 2012 and September 2013. SETTING: A large UK inner city hospital maternity department. PARTICIPANTS: Ninety primiparous women with a singleton pregnancy experiencing low back and / or pelvic girdle pain. INTERVENTIONS: Six weekly 30-minute reflexology treatments compared to sham (footbath) treatments or usual antenatal care only. MEASUREMENTS: Labour outcome data including labour onset, duration of the second stage of labour, epidural and Entonox usage, and mode of delivery. Participant feedback was collected prior to each treatment. FINDINGS: Labour outcomes were collected for 61 women (95.3%) who completed the study. The second stage of labour duration data, available for 42 women (62.5%) who had vaginal births, showed a mean reduction of 44minutes in the reflexology group (73.56minutes; SD= 53.78) compared to the usual care (117.92minutes; SD=56.15) (p<0.05) and footbath groups (117.4minutes; SD=68.54) (p=0.08). No adverse effects were reported. KEY CONCLUSIONS: In this trial antenatal reflexology reduced labour duration for primiparous women who had experienced low back and/ or pelvic girdle pain during their pregnancy, compared with usual care and foot baths. IMPLICATIONS FOR PRACTICE: Reflexology is suitable for use during pregnancy, is safe and enjoyable and may reduce labour duration. Midwives may wish to recommend reflexology to promote normal childbirth and facilitate women centered care. Complement Ther Clin Pract. 2017 Nov;29:122-129. The effect of reflexology on the quality of life with breast cancer patients. BACKGROUND: This study aims to identify the effect of reflexology on the quality of life in patients with breast cancer. METHODS: The population of the study conducted comprised of 60 patients; 30 forming the control and 30 the experimental groups (30 experimental, 30 control). Patient identification forms and EORTC QLQC30 Quality of Life Scale were used to collect the data. STATISTICAL ANALYSIS USED: The data obtained as a result of the study were assessed via computer using ‘Statistical Package for Social Science 21.0′ software. RESULTS: The results of the experiment demonstrated that the within-group symptom total score average of the patients in the experiment/treatment group decreased after the reflexology treatment; while the general health and functional total score averages in the treatment group increased; and the difference between pretest and posttest measurements was statistically significant (p = 0.000). Once symptom, functional, and general health total score averages from the posttest measurement are compared across treatment and control groups, symptom total score average of the patients in the treatment group turned out to be significantly lower than that of the patients in the control group (p = 0.001). In terms of functional and general health score averages, patients in the treatment group scored significantly higher than those in the control group (p = 0.000). CONCLUSION: Reflexology was found to reduce the symptoms experienced by breast cancer patients, while at the same time increasing the functional and general health status. J Altern Complement Med. 2018 Apr 20. Effect of Reflexology on Infantile Colic. OBJECTIVE: The aim of this study was to explore the effect of reflexology on infantile colic. DESIGN: A total of 64 babies with colic were included in this study (n = 31: study group; n = 33: control group). Following a pediatrician’s diagnosis, two groups (study and control) were created. Sociodemographic data (including mother’s age, educational status, and smoking habits of parents) and medical history of the baby (including gender, birth weight, mode of delivery, time of the onset breastfeeding after birth, and nutrition style) were collected. The Infant Colic Scale (ICS) was used to measure the colic severity in the infants. Reflexology was applied to the study group by the researcher and their mother 2 days a week for 3 weeks. The babies in the control group did not receive reflexology. Assessments were performed before and after the intervention in both groups. RESULTS: The groups were similar regarding sociodemographic background and medical history. While there was no difference between the groups in ICS scores before application of reflexology (p > 0.05), the mean ICS score of the study group was significantly lower than that of control group at the end of the intervention (p < 0.001). CONCLUSION: Reflexology application for babies suffering from infantile colic may be a promising method to alleviate colic severity. J Tradit Chin Med. 2017 Apr;37(2):214-9. Effects of feet reflexology versus segmental massage in reducing pain and its intensity, frequency and duration of the attacks in females with migraine: a pilot study. OBJECTIVE: To evaluate the effects of feet reflexology versus segmental massage in reducing pain and its intensity, frequency and duration of the attacks in females suffering from migraine. METHODS: Forty eight females aged 33-58, suffering from migraine for 2 to 10 years were included in this study from November 2013 to November 2015. The study protocol was carried out in Department of Chronic Diseases at the Regional Hospital in Zywiec. In the reflexology group (RG) the patients received a series of 10 treatments 2 times per week; in the segmental massage group (SMG) the patients received a series of 15 treatments 3 times per week. Pain during migraine attacks was assessed using the visual analog scale (VAS), and headache features such as intensity (IA), frequency (FA) and duration (DA) of attacks were assessed before the treatment, just after the treatment, 3 months after the treatment. RESULTS: All variables (VAS, IA, FA and DA) decreased within RG and SMG 3 months after the treatment in compare with the baseline values, and the differences were statistically significant. The differences between groups were also statistically significant. CONCLUSION: Feet reflexology and segmental massage provide a safe alternative for the pharmacological treatment of migraine. The patients with migraine obtain significant health benefits with feet reflexology. J Spec Oper Med. 2018 Winter;18(4):103-105. The Benefits of Reflexology for the Chronic Pain Patient in a Military Pain Clinic. BACKGROUND: Chronic pain is a major cause of disability across the military, especially for the combat Soldier. More than two thirds of Americans with chronic pain are now using complementary medicine. METHODS: Patients with chronic pain opting for reflexology as part of their treatment plan received bilateral therapy. Alternating pressure was applied to the individual patient’s reflex points corresponding to their pain sites. Following a single treatment session, patients were asked to complete a short survey. DISCUSSION: There is evidence that reflexology is therapeutic for many conditions, to include sleep and anxiety, both of which can be comorbidity in the patient with chronic pain. There is a lack of evidence on the use of reflexology with chronic pain patients receiving multidisciplinary pain care. RESULTS: A total of 311 participants completed the survey. Posttreatment pain scored decreased by a median of 2 points (interquartile range [IQR] 1-3) on a 10-point pain scale. This represents a median 43% (IQR 25%-60%) reduction in pain for males and a 41% (IQR 30%-60%) reduction in pain for females. CONCLUSION: Currently research is limited on effects of reflexology in treating chronic pain, yet, like acupuncture, this is an inexpensive, reliable, teachable, and simple noninvasive treatment. Further studies are warranted. Asian Pac J Cancer Prev. 2019 Feb 26;20(2):391-394. INTRODUCTION: Breast cancer is a major threat to women’s health and a common factor that can reduce their life expectancy. Complementary medicine such as reflexology is known to reduce fatigue severity in cancer patients. The present study aimed to cultivate the effect of reflexology on fatigue severity of patients with breast cancer. METHODS: The present pre-post clinical trial recruited 57 patients with breast cancer and involved an experimental and a control group. All patients were livening in Ilam, Iran. Patients were randomly assigned to two groups of experimental (N=27) and control (N=30). The experimental group received reflexology for 4 sessions. Data were collected using Fatigue severity scale (FSS) and demographic information questionnaire. FSS was completed by the patients twice; before the intervention and 2 months after the intervention. Data were analyzed using SPSS and running t-test and ANOVA. RESULTS: Results showed no significant difference in fatigue severity between experimental (45.44±5.30) and control (43.66±7.68) groups prior to the intervention (p>0.05). However, after conducting the intervention, a significant difference in fatigue severity was seen between the experimental (20.66±4.54) and control (40.36±9.58) groups (p=0.000). CONCLUSION: The present study showed that reflexology decrease fatigue severity in patients with breast cancer and community health nursing can to use of these complementary medicine to increase patients health conditions.